After posting a great 2013, GameStop's stock is struggling right now. Here's how the shares could recover and move higher over time. 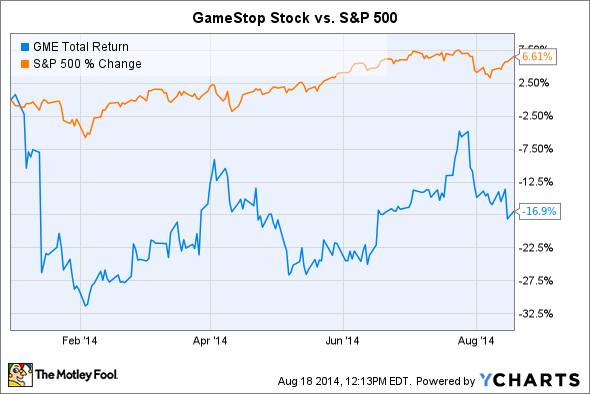 After doubling in 2013, GameStop (NYSE:GME) stock hasn't performed well so far this year. Shares are down almost 20% since January, although they have recovered slightly over the last few months. GME Total Return Price data by YCharts. With the video game retailer set to announce quarterly earnings on Thursday, now is a good time to consider the catalysts that might send the stock higher in the months and years ahead. The most immediate of these is GameStop's potential for beating expectations later this week. That won't be easy given the high hopes embedded in those targets: Wall Street is looking for a 100% profit bounce and a 20% spike in revenue. Those figures would trounce last quarter's 25% and 7% improvements in profit and sales, respectively. Still, there are two good reasons to believe GameStop's business accelerated this past quarter. First, hardware sales were sure to see another lift from the next-gen console rollout. Sony's (NYSE:SNE) PS4 device continues to sell at a healthy pace, and even Microsoft's (NASDAQ:MSFT) less popular Xbox One probably saw a boost after a price cut early in the quarter. Together, the next-gen consoles have been tracking at twice their sales pace from the prior generation, and there's no reason to think that trend reversed this quarter. Second, and more important for GameStop, new AAA titles including The Last of Us and Watch Dogs likely boosted software sales and kept customer traffic humming at its stores, which is why the retailer should post a comparable-store sales jump of as much as 19% over the prior year. Progress in GameStop's efforts to diversify into new product lines could also send the stock higher over time. Those products include wireless services and consumer electronics, which management has identified as key growth areas for the company. GameStop posted big sales gains in both categories last quarter thanks to contributions from newly acquired Spring Mobile and Simply Mac stores. With those gains, the results so far suggest that GameStop can profitably extend its buy-sell-trade business model into these growing categories. That's important because digital sales threaten to eat away at its traditional retailing business over time. After all, game publishers like Activision Blizzard (NASDAQ:ATVI) and Electronic Arts (NASDAQ:EA) are logging record-high levels of digital receipts these days, increasingly cutting retailers out of the sales process. 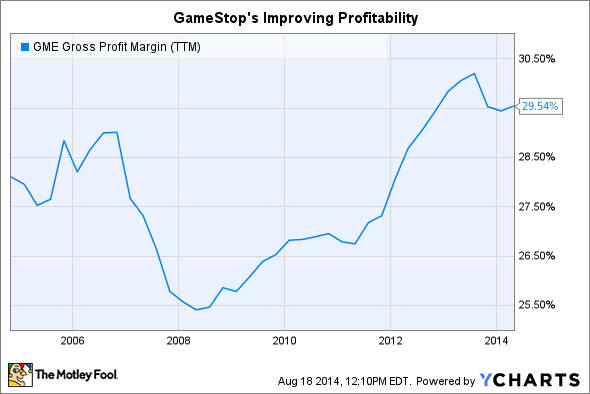 But the strongest case for GameStop's stock rising over time involves a sustained increase in profitability. Investors have already seen a taste of that success: Gross profit margin has been climbing consistently since 2008, recently touching a first-quarter record of 30%. Whether GameStop can hold on to those gains depends a lot on pre-owned video game sales. Those carry the highest profit margin, by far, of any product that GameStop sells. And the good news is that pre-owned software is sure to move higher as a percentage of sales in the years ahead as the next-gen consoles age. GameStop has recently made two major tweaks to its pre-owned video game business: Introducing more value-priced offerings and revamping its pricing structure for trade-ins. The first move is likely to boost GameStop's profit margin on trade-ins to a new high that approaches 50%. It's still early to tell what the second pricing change might do for its business. However, investors betting on the stock over the long term have to believe GameStop can keep its dominant grip on the video game market and protect its industry-leading profitability, all while successfully growing into new business lines.